Flip-Fluvs are wearables designed to help wearers enjoy sunny weather safely. The design was inspired by the fact that sunscreen is a simple but often elided method of protecting one’s skin and body from the various health detriments of UV rays. Since sunlight is usually considered to be positive, people are often unaware of how vigilantly they should protect themselves from its negative effects. 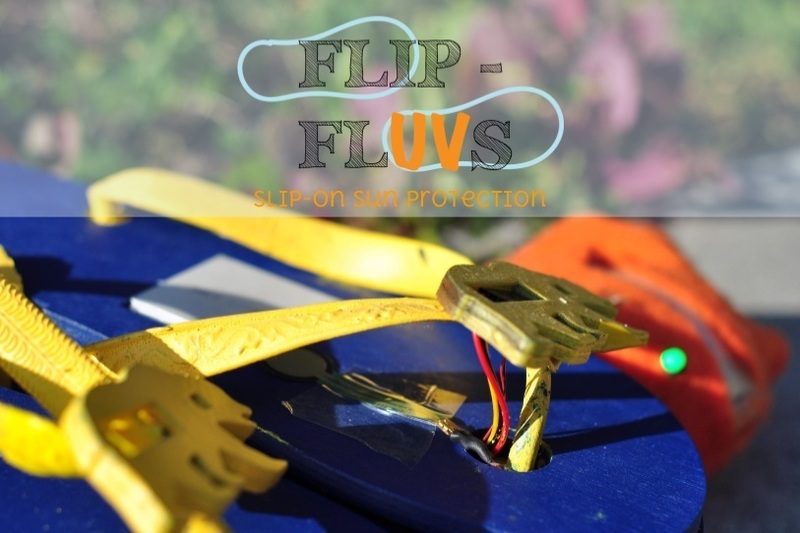 Flip-Fluv is intended to increase their awareness and proactiveness against sun damage. One out of every 5 Americans will develop a form of skin cancer in their lifetime, and each year, nearly 5 million Americans are treated for skin cancer at a cost of about $8.1 billion. Yet the majority of skin cancer can be prevented by avoiding too much exposure to ultraviolet (UV) rays from the sun. For our ethnographic user research, we decided to focus on individuals who care about their skin and regularly wear sunscreen. We found that everyone’s got a sunburn story where they forgot to apply sunscreen, resulting in lots of physical pain. Our initial sketch consisted of a contact sensor at the heel of the foot to ensure that the user was currently standing on the flip-flop, a UV sensor in the center of the shoe logo, a haptic motor underneath, and a peltier under the first layer of the flip-flop, connected to a mobile app. We then received feedback that most people would not have their phones with them since they are at the beach, so we pivoted from a mobile app to a wearable bracelet. We used an FSR as the contact sensor, placed under the ball of the foot, a UV sensor that transmits analog UV indices, placed inside the logo, a haptic motor, placed underneath the logo, and a peltier, placed directly under the foot for maximal contact. 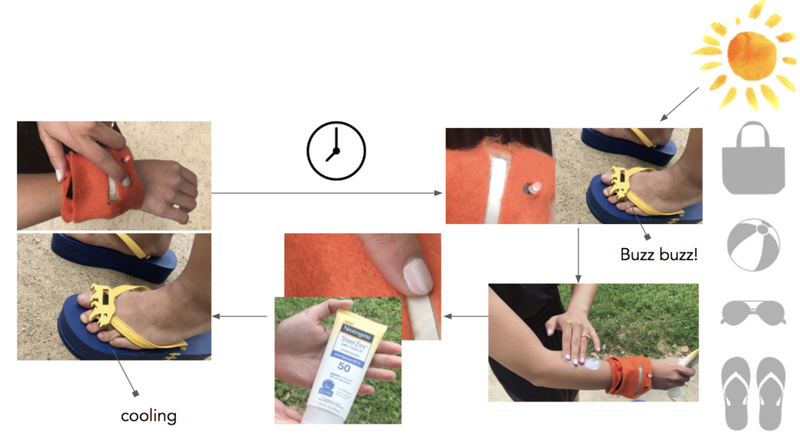 The wristband consists of a soft potentiometer so that the user could record the level of SPF applied, a switch button used to record exactly when sunscreen was applied, and an LED that would notify the user of their sunscreen status (green if safe, red if sunscreen application was needed). We began by creating low fidelity prototype using foam and trying to find a way to house all electronics. We found it is necessary to design it such that it is detachable for ease of removing or testing electronics. All the dimensions of the electronics were measured and modeled them in Rhino for perfect fit. The diagram above shows how different parts come together. The final piece is a custom-designed puzzle joint so that the case is detachable. → Minutes to burn without sunscreen x (0.25)SPF up to 50= max sun exposure where minutes to burn without sunscreen is a factor of UV level recorded. For example, on a sunny day with a UV level of 8, a person who applies SPF 35 sunscreen at 11am should need to reapply at 1:10pm, [(13) x (0.25)(40)] = 130 minutes. Note that in the future, we would like to make “minutes to burn without sunscreen” a dynamic input based on user’s melanin levels. 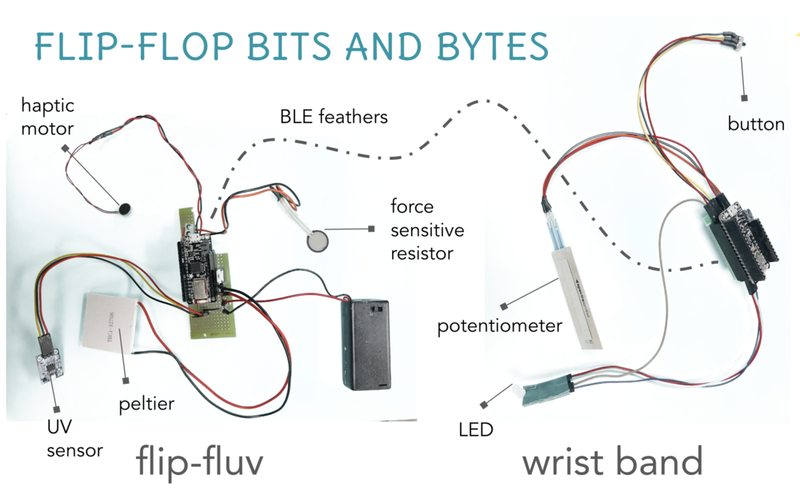 A UV sensor on the Flip-Fluv detects UV rays and triggers a haptic motor on the shoe to vibrate and an LED on the wristband to light up and notify the wearer that they should apply sunscreen. The wearer then uses the wristband to input the SPF they used, which then resets the notification cycle. This triggers the Peltier in the shoe to cool down and provide the user with the reward of a soothing cold sensation.